A safer, easier way to take medications, seven days a week. With Daily Rx, you will have organized tablets and capsules in clearly labeled packets with medication name, date and time they are to be taken. This ensures medications are taken consistently and correctly which increases adherence and leads to better health. Each packet is stored on a roll in an easy to open, convenient box. Each box contains a 30-day supply. Daily Rx is perfect for seniors on multiple medications, caregivers who are charged with managing patient’s medications, travelers and anyone who wants the convenience of receiving all of their medications organized and delivered once a month. It’s also a perfect companion to Clark’s Sync Rx. For more information, call your local Clark’s Rx location. Or call 937-347-3051 anytime Monday through Friday. How can Clark's Daily Rx simplify my medications? Each person’s medication therapy is different, and taking medications correctly can be confusing. That is why Clark’s takes a different approach to solving this problem than any other pharmacy. We can help simplify how you take your medicine through the use of Clark’s Daily Rx. How does Clark's Daily Rx work? 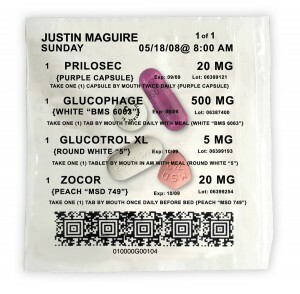 All tablets and capsules that are taken on a daily, routine basis are organized into clearly labeled packets with medication name, day, and time that they are to be taken. This ensures your medications are given consistently and correctly. By taking your medications correctly, you are more likely to stay well. You will receive a month supply at a time. The first month will come in a convenience box. Every other month will come as a roll that will need to be placed in the box. If you need a replacement box, we will be happy to send one. Easy to read labels.Easy to open packets.Easier to remember to take the correct medication at the right time. Traveling with medications becomes easier. All tablets that are to be taken at the same time are packaged together. Eliminates cumbersome vials. Eliminates the need for daily reminder boxes. Saves time! Your routine medications that come in tablets and capsules will be packed in Daily Rx. Medications that are not taken on a regular daily basis, as well as liquid, refrigerated meds, boxed meds, and controlled medications would still come to you in vials and bottles. If being mailed or delivered, must have all other medications filled on same date to prevent extra charges. Can I have Daily Rx mailed to me? Yes. We can mail Daily Rx to you. If you would like to pick up your monthly Daily Rx at one of our seven locations that option is available too. How can I get a hold of someone to talk about my Daily Rx? You can call us at (937) 347-3051 or (513) 452-3051 during normal business hours which are Monday-Friday 9-7. Your new medication will only be filled with enough medication to get you to your next refill date. The new medication will then be added in the next months Daily Rx. Can I use Daily Rx if all my medications are filled on different days? Yes. Clark?? ?s will work with you and your insurance company to get your prescriptions on the same schedule. However, it may take up to 30 days to get all your medications synchronized before your first month of Daily Rx. We can?? ?t fill for a 90 day supply for Daily Rx, but we can synchronize your prescriptions to be filled at the same time. What if I forget a dose with Daily Rx? Your medications work best when taken at the correct times. However, if you do miss a dose, please call our pharmacist or your doctor for information on what to do. Can I use Daily Rx if I am forced to mail away? Each insurance company is different. We will need to contact them to find out if your plan allows for Daily Rx. How do I get Daily Rx? You can pick it up at your local Clark?? ?s pharmacy or we can have it mailed/delivered to your home. If you live in a retirement community, we can deliver your Daily Rx for no additional charge. Depending on where the patient lives will determine whether it is to be delivered or mailed. How do I store Daily Rx? Clark?? ?s Daily Rx should be stored in a dry location out of direct sunlight. Also, since this convenient packaging is not child proof, it should be stored out of the reach of children. Can verbiage on package change? Unfortunately, no. We have to keep them all the same or it will get too confusing. We are working on getting bigger lettering to make the packages easier to read. Attached is also a sheet we will be sending all new patients with the meanings of each line on the pack.